Young David Morton, heir to millions, has been over-zealously restrained from normal youthful activities by his two old-maid Aunts, Harriet and Agatha. In an outburst from his confinement, he meets lovely Gertrude, and promises to race her injured-brothers car in the Big Race. Between the gangsters trying to win the race by disabling him, and his bungling bodyguards trying to bring him home safely, David has a battle to win the race and Gertrude's heart. He succeeds in winning the race, capturing the gangsters and gets his aunt's understanding release. 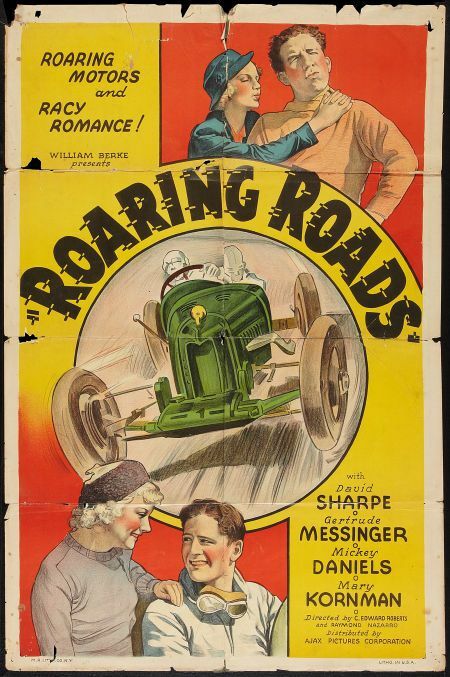 ROARING ROADS is a fun little drama from the 1930s that manages to pack a lot into the short running time (under one hour). It also has a lightness of touch which I found commendable, meaning that the narrative moves along smoothly and even the rough-around-the-edge touches aren't much of a problem. The main character is played by David Sharpe, who also had a hand in the story. He's an amusing dweeb character, an upper class twit mollycuddled by his aunts and longing for an adventure. Through various plot contrivances, an adventure indeed comes along in the form of a pretty girl in thrall to gangsters, one of whom is played by former OUR GANG actor Mickey Daniels.